BigTime Literacy: from striving to thriving - a giveaway! from striving to thriving - a giveaway! It's time to coin a new phrase, friends. No more 'struggling' readers - let's change our mindset and go with 'striving' readers. 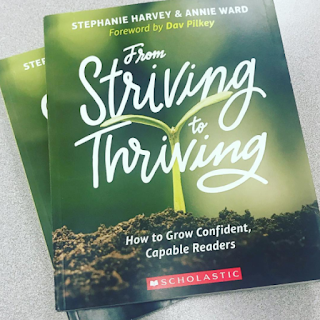 In their new book, Stephanie Harvey and Annie Ward have just this point to make, and share with us how we can move our readers from Striving to Thriving. I just got these copies a few days ago, and haven't had time to read more than just the introduction, but already it's a hit. Here's why. First, the work is grounded in research by two of my favorites: Rosenblatt and Goodman. I've written about Louise Rosenblatt before, but she came up with the transactional theory of reading. This theory states that no two readers read the same story, because each text is a transaction between the book and the reader. Since all readers bring a different set of experiences and schema to the books they read, each interpretation of the text will be slightly different. But Yetta Goodman, well I haven't written much about her. She's a pretty prominent person in my studies, too, because of her 'kidwatching' research. This is basically about how teachers have to observe their students in their work with literacy (teachers as kidwatchers), believe in their own professional judgments, and respect children's abilities. With all of that success will come. In a time when we have so many exteranal ways to collect information - various applications students work on that put out reports of their progress (i.e. Accelerated Reader, Achieve 3000, Lexia, etc), I'm happy to read and be reminded that the teacher is the trained professional in the room, the teacher is the person who should be doing the observations, having the conversations, taking the anecdotal notes, and moving our children forward, rather than waiting on a system of some sort to tell us what to do. The guiding framework throughout this text is Trust, Teach, Transform. The chapters are written in a common format, beginning with a vignette, including key research and teacher moves, and with practice and lessons. In addition, there is a section entitled Assessing Readers in the Round (ARR) which provides questions to guide your kidwatching. I just went through the first chapter and loved what I saw. First, research upon research upon research. There tons of studies referenced and other books that are associated in meaning. Additionally, the practice and lessons are plentiful. One awesome idea that came along with helping kids build their identity was choosing a Walk-Up Song - you know, like at pro baseball games? Well, each reader chooses their own song, they share it with one another, and perhaps a teacher would pay it as they walk up to do a presentation. Through each chapter you will find all of these things: research, classroom vignettes, practice, lessons, and questions to guide your thoughts and actions. All of this is delivered on beautiful, colored pages with tons of graphics and examples of work. After getting through the introduction and first chapter, I'm seeing that the big theme here is that time with books is what is best for our striving readers. Many times, the kids that need the most time with books are pulled to do work with programs to intervene, but in reality, what students need most is time with books and meaningful opportunities to confer with their teachers and peers. Harvey and Ward remind us that, "Programs don't teach kids, teachers do." and that "Becoming a wise reading teacher takes time, thoughtfulness, deep study, and sheer effort." What I'm getting is that you can't just impose a program on kids, but instead, you have to meet with them, read with them, and coach them... and most importantly, provide them HOURS and HOURS and HOURS of reading time. That is the way they will move from striving to thriving. You guys, there's just a little bit on the book, but there is really so so much more. I can't wait to spend even more time with this book, and I'd love for you to do the same! I have an extra copy of the book to give away! To be entered into the drawing, just leave a comment here on this blog post. Tell me about how you kidwatch in your classrooms - what observations are you using and how is that guiding your instruction with your students? 1. Make sure you are not a no-reply commentor. Check out this link to make sure I'll be able to reach out to you if you are chosen. 2. Chosen winner must be from the United States. The biggest kid watching I'm doing involves the "status of the class". It gives me good information to have those conversations with kids about what they're reading and why. I kid watch by helping my students choose books that are of interest to them and tht they can understand. This doesn't necessarily mean "on their level" as long they can answer specific questions about the book that I ask, then I'm ok with it. Knowing what they are reading helps me to understand them much better. I Just read the first chapter of this book through scholastic. It looks great and I feel like it mirrors what I'm seeing in my classroom as I'm kid-watching during reading workshop. Those kiddos who are struggling need more time with books in their hands. Thanks for the post. I've been looking for self-starters. Kids who get started on something right away without waiting for the gold leaf invitation to please start working. It shows a lot about their work ethic, comfort level and self-esteem in class. From Striving to Thriving sounds refreshing and a needed reminder that teachers make the difference. Love this! Thank you for sharing so much -- and you've only read the intro.!! You just know they are going to share so much more! I love kidwatching and just having real and honest conversations with kids about books and reading. I know they may not feel the same way as I do about books, but I try hard to bring them into the joy of reading. These thriving readers -- this is who I work with day in and day out .... but I also need to work alongside thriving teachers who may not be spreading the book love too! We still have so much hard work to do, but we are going to keep doing it! Thanks for the opportunity! Can't wait to read more! A lot of kid watching during my engagement inventories as the reading coach and I love seeing kids engrossed in a text and then able to ask them at lunch or in the Hall about what they were reading and whether they think I’d enjoy it. Such rich conversations and allows me to connect with my readers of all ages and stages. Love the idea of “striving readers” vs. “struggling readers”. Definitely reminds me of how our kids work to the expectations we place on them and before them. A mindshift begins now with me! Gotta get my hands on this resource!